Paul Xavier Kelley was born on 11 November 1928 in Boston, MA. He earned his Bachelor of Science degree in Economics from Villanova University in 1950. Kelley was commissioned a Second Lieutenant in the U.S. Marine Corps in June 1950. After The Basic School in March 1951, he served with the 2nd Marine Division at Camp Lejeune, NC, as an infantry officer in a wide variety of billets, including his first assignment to Aircraft Engineering Squadron-12 (AES-12) out of Marine Corps Base Quantico, VA. In September 1952, he was assigned to the USS Salem (CA-139) where he served for 20 months, first as Executive Officer and then as Commanding Officer of the Marine Detachment on the Salem. In December 1953, he was promoted to Captain. From July 1956 to December 1957, Kelley served as the Special Assistant to the Director of Personnel at Headquarters Marine Corps, Washington, DC. He then completed the U.S. Army Airborne Pathfinder School at Fort Benning, GA. In February 1958, he was assigned to the newly activated 2nd Force Reconnaissance Company, Force Troops, Fleet Marine Force, Atlantic, Camp Lejeune, when he served as the Executive Officer and then Commanding Officer. From September 1960 to May 1961, he was the U.S. Marine Corps Exchange Officer with the British Royal Marines, becoming one of the few foreigners to earn the Royal Marines Commandos' coveted green beret. During this tour, he attended the Commando Course in England, served as Assistant Operations Officer with 45 Commando in Aden, and as Commander "C" Troop, 42 Commando in Singapore, Malaya and Borneo. On 1 March 1961 he was promoted to Major. From June 1964 until August 1965, Kelley was Commanding Officer, Marine Barracks, Newport, R.I. In 1965 he deployed to Vietnam. He first served as the Combat Intelligence Officer for the 3rd Marine Amphibious Force, FMF, Pacific. Following this assignment, he served in combat as the Commanding Officer, 2nd Battalion, 4th Marine Regiment. He was promoted to Lieutenant Colonel on 20 January 1966. Four years later, 1970-71, Kelley commanded the 1st Marines, which was the last Marine Regiment in combat in Vietnam. In 1974, Kelley was promoted to the rank of Brigadier General. As a general officer, he served as Commanding General of the 4th Marine Division, Fleet Marine Force; Director, Marine Corps Development Center; Director, Marine Corps Education Center; and Deputy Chief of Staff for Requirements and Programs, Headquarters, U.S. Marine Corps. On 29 June 1976 he was promoted to Major General. In February 1980, Kelley was promoted to Lieutenant General and named as the first Commander of the Rapid Deployment Joint Task Force. 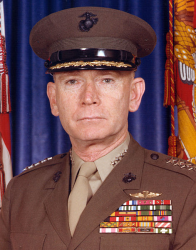 On 1 July 1981, Kelley was promoted to the rank of General and became the Assistant Commandant of the Marine Corps and Chief of Staff, Headquarters Marine Corps. On 1 July 1983, Kelley was named the twenty-eighth Commandant of the Marine Corps, succeeding General Robert H. Barrow. General Kelley retired from the Marine Corps after completing his term as Commandant on 30 June 1987. • Eureka College, alma mater of President Ronald Reagan, named General Kelley as its third "Honorary Reagan Fellow" to celebrate his lifetime of service and leadership on 9 November 2010 at the Reagan Building in Washington, DC. The date was chosen to correspond with the 21st anniversary of the fall of the Berlin Wall. In 1989, General Kelley joined the Washington public policy firm Cassidy & Associates; he is the Vice Chairman Emeritus. From 1989-94, he served as Chairman of the American Battle Monuments Commission. Kelley is on the board of directors for a number of corporations, including Allied Signal, Inc.; GenCorp, Inc.; Saul Centers, Inc.; Sturm Ruger & Co., Inc.; and the Wackenhut Corporation. In December 2006, Kelley chaired a panel of military and business leaders looking to improve the U.S.'s energy security. They recommended tougher emission standards and greater access to offshore U.S. gas and oil reserves. On 26 July 2007, the Washington Post published an op-ed by Kelley and Robert F. Turner, a Reagan Administration lawyer. The article warned that the 20 July 2007 Executive Order issued by President George W. Bush, purporting to define torture and allowable interrogation methods, appeared to violate Common Article 3 of the Geneva Conventions.